We WILL NOT be having pickup on Tuesday the 4th! All members who pickup on Tuesday will pick up on Monday July 3rd 5-7:30 on the Mason’s front porch! We will post this announcement at the top of every news letter until the 4th of July. Phew! What a week we had last week! Monday it was 90 degrees and windy in the fields. Tuesday we had over an inch of steady rain and winds (No gusts! No Hail!) during a harvest day; the lettuce mix was literally blowing away in the wind during harvest. Wednesday we had a high of 55. Thursday and Friday were perfect weather for working outside; overcast with a high of 65. Saturday we had a beautiful mild sunny day. This week we will celebrate summer solstice on Wednesday. On solstice we like to mindfully respect the humbling power of this season; so full of sun and light. As we approach summer solstice, and the longest day length of the year, we are feeling the fullness of the 16+ hours of daylight. 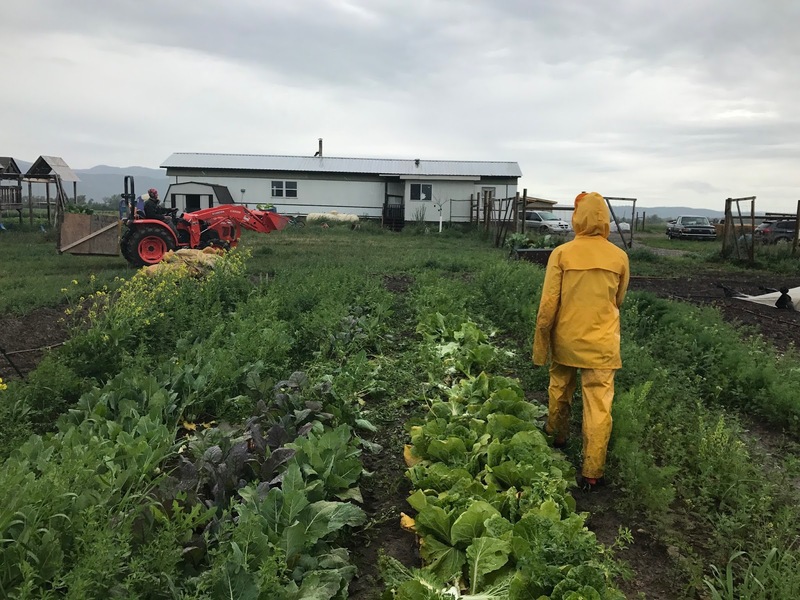 The day length in our northern latitude (48 degrees north) in combination with our year round cool nights makes Northwest Montana an ideal place for growing greens and we know it’s easy to OVER DO IT and put too many greens in your box. Loooooonnnnnnggg ago we lived briefly in Philadelphia and we were members of a CSA there. Little did I know then that I was learning about what I didn’t want my own CSA to be like someday. Each week we went to pick up and came home with about $20 of kale. Seriously; kale of all shapes, sizes, and colors. I love kale and I’m pretty decent at cooking with it, but that CSA was too over the top with the greens. Remembering our own CSA experience, we try to never overload the boxes with braising greens. We really want your nightly meals to be able to be prepared from the contents of your CSA box. That said, in our climate, even on ‘the first day of summer’ and well into the first weeks of summer the things that grow the best here are leafy. The summer veggies are in the ground and growing slowly. The 60 degree weather this week, and in the coming forecast, are pretty typical for June in Montana. Our green beans are up and getting their true leaves, the squash look pretty much the same as when we set them out three weeks ago (this happens every year then all at once they are huge and fruiting! ), the tomatoes and cucumbers are growing a little everyday….and the kale...well, you can pretty much cut it to the ground right now and it will be as tall as a human child in ten days. This week it is officially summer AND we will have ‘summer veggies’ in the coming weeks and months AND for now we get to enjoy these abundant leafy veggies. In a large heavy bottomed pan melt one stick butter, saute a whole bundle (or two) of chopped green onions, add salt and saute, while the onions start to cook peel and shred about 1 lb or six cups of grated kohlrabi, add to pan and saute (you could use shredded cabbage, or any other root vegetable as well). Prepare your favorite mac and cheese casserole and stir in these lovely sauteed veggies and bake as usual. and your DILL would be lovely in some dressing! Or chop up your dill and keep it in a covered container in the fridge; what isn’t good with fresh dill on it? Little bit of Basil-after this week when we include basil in the shares it will usually be 2 oz of basil for full shares and 1.5 oz for partial shares. We are dividing all of our first basil harvest among our CSA members. Our family will make our first basil topped pizza of the year to celebrate solstice! Golden Beets- If you’ve never had these you are in for a treat! The beets are still small this time of year and roasting and eating these may just be the culinary highlight of your week. When they are small I don’t peel beets; I just cut them in half and roast in butter in the oven until soft. Golden Beet tops may just be my favorite of all the braising greens ( I know what you are thinking... ‘But you say that about all the greens’). Beet greens are super nutritious and crazy high in potassium, but all that healthy stuff aside, the best thing about them is that they taste amazing. We used sauteed beet greens for our weekly breakfast casserole this week (golden beet tops, green onions, hakuri turnips, pork sausage and Parmesan cheese egg bake!) . Beet tops are very similar to chard and like chard they can be used interchangeably in ANY recipe that calls for cooked spinach.